Sony GTKXB60 Bluetooth Speaker - Black. Condition is Manufacturer refurbished. Shipped with USPS Priority Mail. The best choice for a comfortable life. 1 x Soundbar. Suitable for Different Electronics : This speaker bar is compatible with numbers of electronic devices with audio play fonction, such as TV, PC, smartphones, tablets, CD/DVD and MP3/MP4 players. TDX - 6.5" Wall Mount Speakers (Pair). Woofer Type: Polypropylene Cone. Tweeter Size.50". Woofer Size: 6.5". Ideal for indoor and outdoor use (not waterproof, but great to hang under eaves). Wall mountable attached bracket. Logitech Surround Sound Speakers Z506. DVD player. Noteworthy Features. Rich 5.1 surround sound. Rich 3D stereo surround sound. Computers, music players, TVs, DVD players and other audio sources with 3.5 mm or RCA audio out. 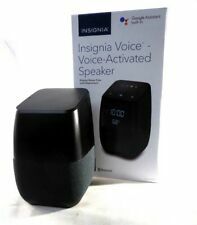 Insignia™ - Voice™ Smart Bluetooth Speaker and Alarm Clock with the Google Assistant built-in -NS-CSPGASP. With the touch of a few buttons, you're ready to enjoy multiroom music. The speaker features a digital LED clock display and has a built in alarm clock. Amaha ATS-1070 35" 2.1 Channel Dual Built-in Subwoofers Soundbar. Built-­in subwoofers for deep bass without a second box. Experience your favorite TV shows, movies and music with clear, dynamic sound. Remote and optical cable included. 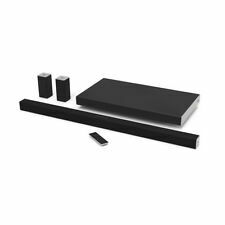 Samsung - 2.1-Channel Soundbar System with 6.5" Wireless Subwoofer - Black. Samsung 2.1-Channel Soundbar System with 6.5" Wireless Subwoofer. Enjoy clear sound on everything from sporting events to movies with this Samsung surround bar. ONN 2.0-Channel Soundbar With Bluetooth 16. - 2.0-Channel Soundbar With Bluetooth 16. All our electrical / electronic products work only on 110 Volts. Discover cinema-quality sound in portable pint-sized form with the Mini Sound Bar from LyxPro. - 1 x Mini Sound Bar from LyxPro. - Pair speaker with any Bluetooth device [LyxPro LSBM-12]. - Speaker drivers: 50mm/40HM/10Wx2. Audio Output: 2.2CH Bluetooth soundbar. Main Parts: all-in-one TV soundbar. Power output: 20W 2 tweeter 25W 2 (Built-in Subwoofer)(90W). 【Wired and Wireless】Bluetooth technology 4.0 EDR with A2DP & AVRCP for seamless streaming from various devices, lets you enjoy high-quality audio and lose wires; or choose wired connection including Aux/USB/coaxial/optical inputs, what's more, AUX/optical/RCA cables provided. Excellent condition. Misunderstanding of the functionality. Trending at $26.00eBay determines this price through a machine learned model of the product's sale prices within the last 90 days. With the front facing bass reflex port, low frequencies are emphasized giving the bass more power. You can also alter your music from the ease of your couch with the wireless remote. It can be connected to more than one audio device through the two RCA inputs. This pair of 5.25" speakers can be used for in-wall and in-ceiling applications as they mount flush for a clean look. Achieve wide-ranged sound performance and add audio to any room with the PDIC Speaker Systems. Ultimate Ears POWER UP charging dock. Charging D-ring. Functional Condition. Upgrade your sound setup with these Insignia Bluetooth bookshelf speakers. 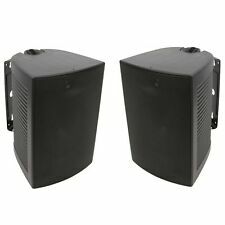 Insignia - Powered Bookshelf Speakers (Pair) (NS-HBTSS116) - Black - by Insignia. New Open Box. Box shows signs of damage from shipment. If you're looking for affordable and versatile bookshelf speakers with uncompromising sound, Studio 1280T is your go-to 2.0 speaker system. Studio R1280T lets you connect to multiple audio devices using the dual RCA inputs. LG SK9Y - 5.1.2 ch 500W High Res Audio Sound Bar with Dolby Atmos. Dolby Atmos. 5.1.2 Channel (2 Up-firing Speakers). High Resolution Audio (24bit/192kHz). Step 1: After Checkout. Dolby Digital Plus. Dolby Digital. This CTA-certified sound bar can also play back high-resolution audio at up to 24-bit/96kHz quality. Also stream audio via Bluetooth. 300 Watt - 2.1 Channel. High Resolution Audio. We proudly stand behind the quality of our products. If need password, then type"0000". After connected, it will be voice "connection successful". Then play music by bluetooth mode, the blue LED indicator will flash slowly. Lose the wires and listen to your music with a tap of a finger from anywhere in the room. Built in DSP, Audiophile Sound Quality, Super Loud! 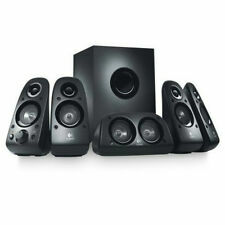 New ListingBose 161 Black Bookshelf Speakers with Wall Mounts MINT!! Most sold on eBay! Over 500 Sold! Trending at $171.50eBay determines this price through a machine learned model of the product's sale prices within the last 90 days. CANCELLED IN SHIPMENT!!! SHIPS FREE AND FAST!!!
' ' ---In-Wall / In-Ceiling System ---2-Way Stereo Sound Speakers ---6-1/2'' Midbass Speaker ---1'' High Temperature Voice Coil ---1/2 Inch Polymer Tweeter ---200 Watts Rated Peak Power ---4-8 Ohm Impedance ---Frequency Response: 70Hz - 20kHz ---Mounts Flush on Walls or Ceilings ---Perfect for Custom Installations & Applications ---Includes Cut-Out Template for Easy Installation ---Cut-out Dimensions: 7 3/4''W x 11 3/8''H x 2 7/8''D ---Overall Dimensions: 8 3/4''W x 12 1/2''H x 2 7/8''D ---Sold as: Pair ---Weight: 7.02 lbs. The Pyle PDIW65 speaker system delivers stereo sound to any room in your home or office without cluttering floor space. This pair of 6.5'' speakers can be used for in-wall and in-ceiling applications as they mount flush for a clean look. TDX 12-Inch Down Firing Powered Subwoofer Home Theater Surround Sound Black 12"
TDX - 12" Down Firing Powered Subwoofer. Woofer Type: Polypropylene Cone. Woofer Size: 12". Woofer Quantity: 1. Down Firing Port: for deeper bass response and reduces port noise. Tired of watching movies without experiencing the sound the director intended?. Simply connect your TV and other HD devices or stream content wirelessly via Bluetooth and NFC. 300W 2.1 channel sound bar w/wireless subwoofer, Easy set up with 3 HDMI in/1 out and ARC support, Stream music wirelessly w/Bluetooth & NFC connections. M ODEL: CRS One 6.5". In-Ceiling Speaker PAIR (2 Speakers). Listen to your playlist anywhere with this portable ION Audio Plunge boombox. Model Number: PLUNGE. Pair this speaker with your smartphone, tablet or other Bluetooth-enabled device. Built-in microphone. 6 speakers including a subwoofer and 5 surround speakers - front left, front right, rear left, rear right and center. 5 surround speakers and a subwoofer. Subwoofer- 4 Ohms, Speakers - 8 Ohms. It includes. LG SK1 2.0-Channel Soundbar with 40-Watt Digital Amplifier Black - NEW SEALED. Built-in Subwoofer to make sure high-quality sound. Make you have a wonderful hearing experience, Enjoy your favorite Music, Movie. Relax your life! Sound bar is with Bluetooth 4.0, Bluetooth module adopts RF technology.